Synopsis: After three girls are kidnapped by a man with 24 distinct personalities they must find some of the different personalities that can help them while running away and staying alive from the others. Review: I hate to say it, but M. Night Shyamalan brought it all on himself. With a succession of movies, the writer/director (producer, cameo, etc.) introduced sophisticated ideas wrapped in a mystery to less and less fanfare. Known more for his twist endings than the sum total of his accomplishments, the director of The Sixth Sense, Unbreakable, and Signs began to lose himself in the inner-workings of his storytelling. Sacrificing plot, good dialogue, and characterization for that one moment, “the twist”, that would entice an audience into sticking with the film despite the absurdity of it all, it wasn’t long before Shyamalan’s name stopped being the selling point and instead became an Achilles Heel. Laying low for a few years and producing the occasional movie or TV show, Shyamalan emerged from the shadows with 2015’s The Visit, a tight little scare fest made for a small fee which wound up doing surprisingly good business. Showing he wasn’t entirely beholden to his twist endings (though that film did have one), good will led Shyamalan back into the conversation and it felt as if his second act in Hollywood had begun. The first thing I’ll tell you about Shyamalan’s Split, and to keep spoilers squashed I won’t tell you much, is to do your best to go in without thinking of this as the horror film its being falsely marketed as. True, the film boasts a few nerve jangling moments and an overall sense of dread usually reserved for films with a high body count, but I made the mistake of expecting a thrill ride when in reality Split is more like an uncomfortable Sunday drive. A trio of girls celebrating a birthday at a local mall are abducted in the parking lot and held captive in an underground compound by a man (James McAvoy, Trance) with dissociative identity disorder (DID). While two of the girls (Jessica Sula & Haley Lu Richardson, both largely forgettable) plot a way of escape, the third (Anya Taylor Joy, Morgan & The Witch) takes a different approach, recognizing their captor could be manipulated depending on which of his 23 personalities they are talking to. Time is running out, though, for several of the identities talk of a 24th personality, The Beast, that’s “on the move.” Meanwhile, the man’s psychiatrist (Betty Buckley, Carrie), disturbed by a concerning change in demeanor for her patient, attempts to lure out the new personality that’s been causing trouble. To me there are two short films going on here with overlapping ideas that Shyamalan couldn’t quite stretch to feature length. The first is the kidnapping plot with its increasingly desperate attempts at escape from the teenagers and the second is a film centered on the psychiatrist exploring the inner workings of DID. Both have some value and are staged nicely by Shyamalan with tight close-ups that give the film a claustrophobic feeling but to really take on discussions of mental illness Split needed to choose which story to tell and it never can decide. Taylor Joy’s saucer-eyes look great in a Shyamalan close-up and the actress keeps a sense of mystery along the way that’s as interesting as it is slightly creepy. Through flashbacks we see her as a child spending time with her father and uncle; there’s something off about these memories and as the film progresses, we begin to see why. Shyamalan throws a lot of unspoken feelings at Taylor Joy and asks her to fill in the blanks which she winds up conveying quite convincingly. Surprisingly, it’s Buckley that nearly steals the show…though considering her storied history on stage and screen it’s not that surprising at all. Her therapy sessions with McAvoy’s character(s) give the film it’s most crackling edge and I kept wondering if these intimately crafted scenes hadn’t originally been written for the stage. Buckley doesn’t appear on screen as often as she should but her performance here makes you wish she would. At the end of the day, though, this is McAvoy’s picture and he walks away with the whole kit and caboodle. There’s such a very fine line between honest and camp when it comes to playing a character with multiple personalities but McAvoy approaches each with a level of dignity and respect. True, there are some moments McAvoy got too actor-y for my taste but overall it’s a dynamic, full-bodied performance that goes far beyond simply changing his voice or how he holds himself. With each new personality introduced, McAvoy seems to change appearance entirely which makes the impending arrival of the feared 24th identity even more ominous. Audiences familiar with Shyamalan have been well trained to prepare for a twist but my advice would be not to look too hard. 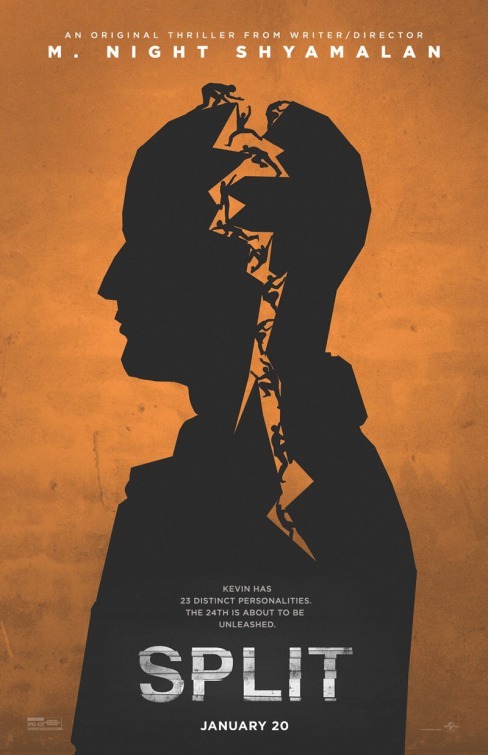 There are a few late-breaking turns that won’t come as a total surprise and one big shocker at the end you’re either going to love or hate (the audience at mine was an audible mixture of both) but Split is less concerned with fooling its audience and more interested in bringing them into the mind of trauma victims coping with their past in the present. It’s not an entirely successful film (and at nearly two hours, a too long one at that) but it’s stuck with me just like Shyamalan’s earlier work did. Synopsis: Kevin, a man with at least 23 different personalities, is compelled to abduct three teenage girls. As they are held captive, a final personality – “The Beast” – begins to materialize. 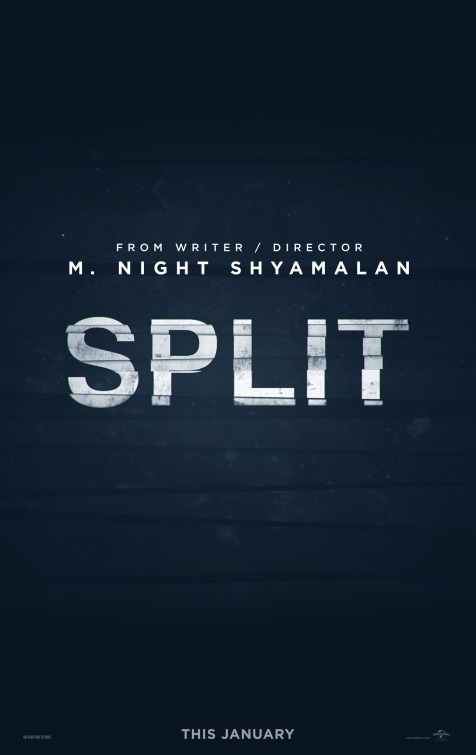 Thoughts: There was a time when the presence of director M. Night Shyamalan’s name on a poster or movie trailer would elicit a little shiver down your spine. Then came a string of overstuffed, self-serving duds that found his name removed from all marketing materials in order to not tip off audiences he was involved. Then along came the surprisingly strong (and scary!) 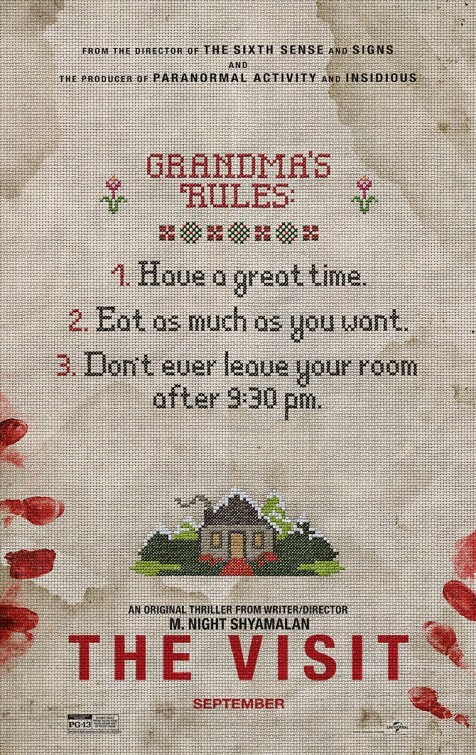 The Visit in 2015 and Shyamalan got some of that clout back…and I’m hoping that Split continues the Shyamalan-aissance. 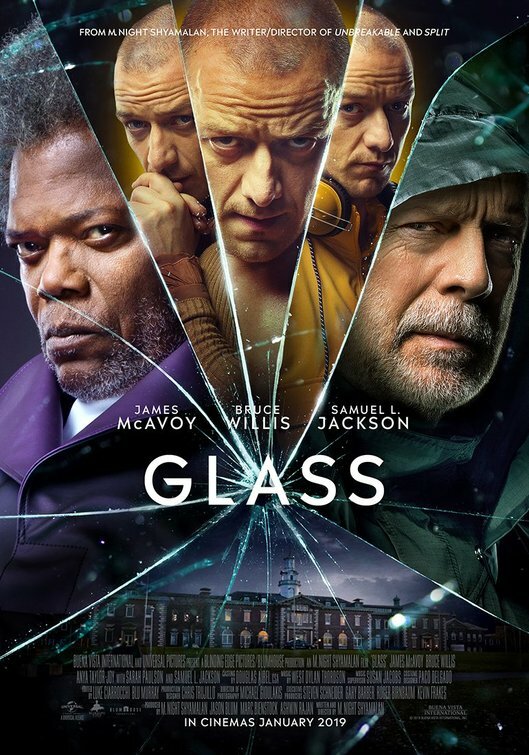 The latest thriller with a twist finds James McAvoy (Trance) with multiple personalities holding three girls hostage and there’s some nice potential here for some spooky scenery chewing. With January no longer that foreboding dumping ground for useless films that it once was, could Split ring in the New Year with a yelp? Synopsis: A single mother finds that things in her family’s life go very wrong after her two young children visit their grandparents. Review: I remember seeing the preview for 2006’s Lady in the Water and when director M. Night Shyamalan’s name appeared the entire audience squealed with terrified delight. By that time, Shyamalan had become synonymous with twist endings and scary tales more interested in the human side of horror than blood and guts. After The Sixth Sense, Unbreakable, Signs, and The Village Shyamalan was riding high but he’d wind up drowning with Lady in the Water, a self-serving bit of poppycock that felt more like an ego trip than a fully formed movie (Shyamalan wrote, directed, and had a significant role in the film…an ill-advised move). It was all downhill from there as Shyamalan followed up Lady in the Water with his first R-rated flick, the hysterically terrible The Happening in 2008 featuring a too-serious Mark Wahlberg having a conversation with a plastic plant he thought was out to do him and his family harm (!). Things only got worse with 2010’s The Last Airbender before he hit rock bottom in 2013 with After Earth, starring Will Smith and his son Jaden, two actors with possibly even bigger egos than Shyamalan. In the span of several years, Shyamalan’s name went from being the top selling point of a movie to a moniker that spelled box office poison. I’m not sure what happened in the last few years but Shyamalan must have taken a long hard look at his career and made some changes for the better. He scored as the producer and occasional director of Fox’s eerie mystery show Wayward Pines and he’s back in top form with The Visit, a keep-the-lights-on at night thrill ride that could have gone very wrong but winds up hitting (almost) all the right notes. 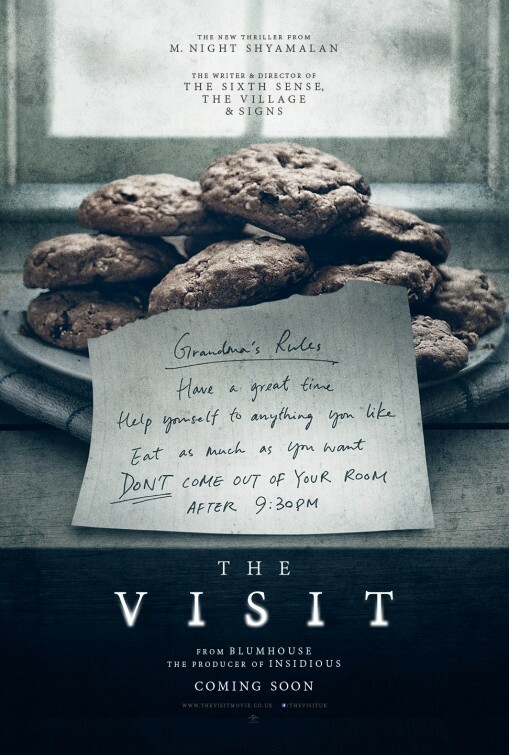 I must admit that when I heard The Visit was a found footage film my heart sank a bit for Shyamalan…what was he doing tapping into the genre that has two feet, hips, and a chest already in the ground (see the wretched The Gallows if you don’t believe me)? While I still marvel at the fact that even in moments of high horror the person holding the camera manages not only to keep a hold of the device but also frame things like a recent film school grad, I have to say that Shyamalan makes good use of the found footage angle and finds a few new ways to exploit the trope. Opening with Kathryn Hahn (We’re the Millers) nervously sending her kids off to her estranged parents’ house for a week, Shyamalan offers just enough back story to push off from, choosing not to linger too much in history. We know that Hahn’s single-mom hasn’t seen her parents in 15 years and her two children have never met them. They’ve tracked her down and want to meet their grandchildren and, as a way to make-up for her behavior when she left home, she agrees. That’s fine and dandy for her kids Becca (Olivia DeJonge) and Tyler (Ed Oxenbould, Alexander and the Terrible Horrible No Good Very Bad Day) because they want their mom to spend time with her new boyfriend and also to help build a bridge between the grandparents they’ve never known and their mom who carries a heavy burden of guilt that she won’t speak about. It’s nice to report that DeJonge and Oxenbould are not only good child actors but that Shyamalan didn’t sketch them in the typical annoying kid kinda way…these are normal, decent kids with big hearts. Arriving in a rural Pennsylvania town, they’re greeted by Nana (Deanna Dunagan, excellent) and Pop-Pop (character actor Peter McRobbie) and aside from some awkward first meeting jitters, all are soon settled in a quaint farmhouse near a frozen lake. Nana makes good meals and Pop-Pop seems interested in the kids and what their life has been like. It all goes swimmingly until…well, things get weird. Over the next several days and nights red flags start to pop up that give the siblings cause for some concern. I have to be careful what I say because the last 2/3 of the movie is full of spoiler-heavy turns that keep you on the edge of your seat as you try to figure out what exactly is so off about the grandparents. The “big twist” that Shyamalan is so well-known for is fairly easy to predict, but even if I did have some notion of how it was all going to turn out Shyamalan throws in interesting curveballs that throw you off along the way. And did I mention it’s scary? Like, legitimately scary. I’ll easily jump as much as the next person if there’s a jolt of loud music or something leaps out at you, but Shyamalan has cleverly crafted sequences with the kind of sustained scares rare to not only the found footage genre but the horror genre in general. More than once I had a rash of goosebumps emerge and felt my cheeks flush with an uneasiness that was exciting/scary/fun all at the same time. Amidst all the expected shrieks there’s one highly effective scare and another gross out moment that had our audience rightfully speechless. If the film has some flaws, it’s in a few more light-hearted moments that can throw off the balance of the tone of the film. I can absolutely see why Shyamalan would want to toss in a few comedic moments to ease some of the tension (Oxenbould’s rapping skills are put to good use…maybe one too many times) but they are oddly placed in the middle of some fairly frightening moments, creating the feeling that it’s all one big joke to the director. No matter, even these small moments don’t detract from a film that winds up being about more than just scaring you but manages to teach a small (if heavy-handed lesson) before the credits roll. If this is the new Shyamalan, then I welcome him back with open (and slightly petrified) arms. Synopsis: After a crash landing, a father and son explore a planet that was evacuated by humans 1,000 years earlier. Thoughts: The most impressive thing about this trailer is not some nice visual effects or the faint hope that Will Smith and son won’t mug their way through an entire movie. No, what impresses me most about this is the complete absence of the name of the director, M. Night Shyamalan. After his success with The Sixth Sense, Unbreakable, and Signs, the once hot director flamed out with a growing list of absolute disasters in Hollywood due in large part to an ego the size of Texas. There was a time when Shyamalan’s name alone could be the centerpiece of a trailer but its total non-presence in this first preview for After Earth feels like a studio gun-shy about letting that particular cat out of the bag to audiences. I’m not sure how I feel about After Earth yet, not really being a fan of Shayamalan or the Family Smith…but perhaps it will be a return to form for all involved. One thing is for sure, if this is a bust the blame will fall squarely on Shyamalan’s shoulders.